Quickly create an appointment that suits your customer’s availability using the Loc8 web or mobile app. Dispatch to one or more technicians or sub-contractors using custom region and trade-based assignment in calendar or quick scheduling modes. Field technicians will be notified in real time of any new or updated appointments and can action them immediately or when scheduled to. If it was assigned to the wrong person, it can simply be reassigned in-field. All changes are visible across the entire cloud-based system in real time. 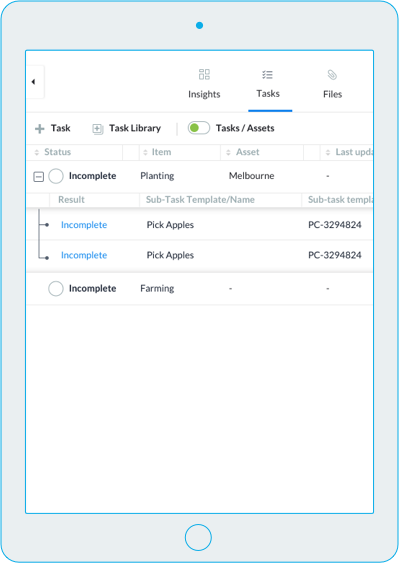 Create task-based work orders with explicitly defined tasks and sub-tasks on the fly, or store and manage them via a dedicated task library for use again in the future. Action each and every task in-field with detailed notes and photos. If a task couldn’t be completed, mark as incomplete or create a follow-up rectification task. Easily Record all Job Details on the Go! Loc8 automatically creates detailed work reports at the conclusion of each and every appointment based on time and travel logged, tasks completed, inventory used and of course, customer sign-off. Drill into each report to understand exactly which tasks were performed on-site and by who, how much time was spent traveling vs working and whether you need to create a follow-up appointment for further work. Share the report with your customer using a live web view that is branded using your company logo and details. Set out whether to charge for tasks, time and travel on each work order. Also, compare the initial estimate or quote and projected values as work progresses. This will tell you if you’re anywhere near to making profit or not. List the templates that define whether to charge for on-site time, travel, callout charges, tasks and inventory. And, in no time, you can create invoices by simply associating the template with the customer, a quote or work order. 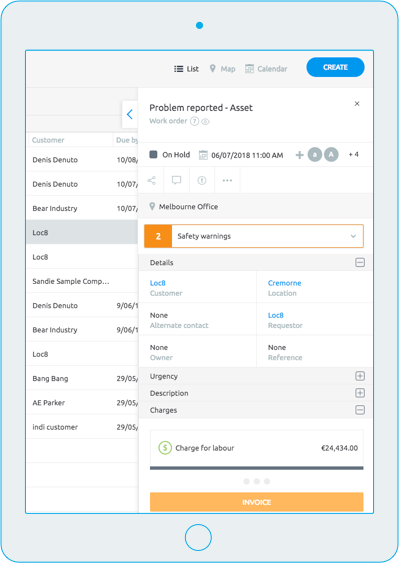 Create custom work order priorities and job types to standardise your response time and ensure that each job is scoped, managed and completed correctly. Specify regions and trades against each technician, and when they are set as a requirement on a work order, only the matching people will be made available. 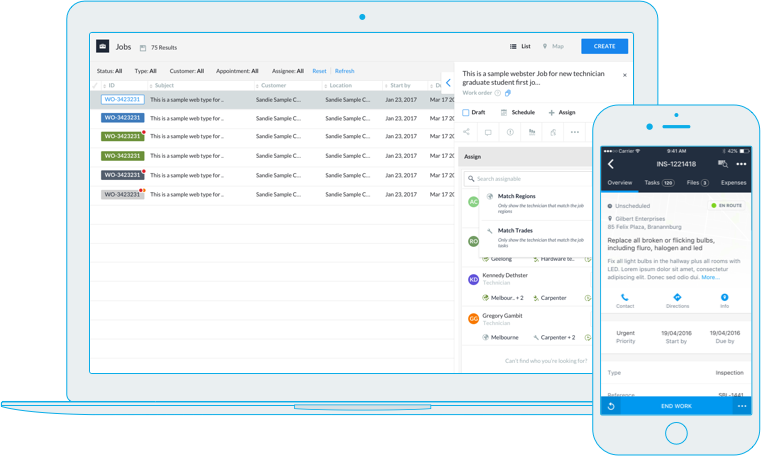 Define custom statuses for work orders, and then leverage our powerful assistive workflows on our mobile tool to ensure your technicians select the right statuses. We maintain a highly detailed change history on each work order, appointments and tasks. Optionally, tag changes made on mobile with GPS coordinates. Record inventory usage for each appointment, including the ability to specify a purchase order number, costs and notes and whether or not the inventory is chargeable. Log any safety issues that have been identified at a customer’s site, and all work orders will be automatically updated with that information, including user acknowledgement.